Almost everyone in the world likes the amazing Flappy games. In this new edition you will meet another couple of your favorite characters – Dipper and Mable Pines on a long way through a pipe system. Have fun! 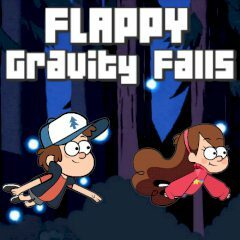 Dipper and Mabel need your help in this free arcade game! They must break through a narrow pipe system. Help them to overcome obstacles and to earn as much score as they can on their way in this online skill game. Get ready well because your way will be long and difficult, but be persistent enough, and you will certainly reach your goal!